by Dr. Christopher Chang, last modified on 10/21/18. One of the most common procedures performed in the United States is the placement of tubes in a person's ears for chronic ear problems. In children, ear tube placement is most commonly performed for chronic ear infections or persistent fluid in the ears causing hearing loss (serous otitis media). 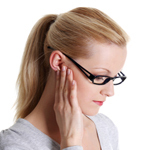 In adults, the most common reason is for eustachian tube dysfunction as well as serous otitis media. The surgical procedure used to place tubes in the ear is called "myringotomy and tube placement." So, why does ear tube placement help in these situations? What do tubes look like? How are they placed? When is it time to place tubes? This webpage is to help answer these vexing questions that patients wonder about. 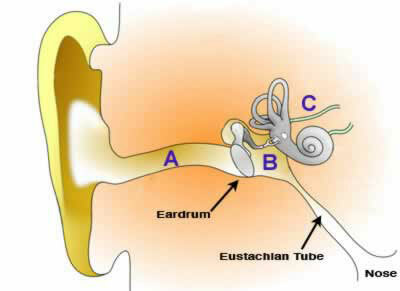 In a normally functioning ear, the eustachian tube connects the space behind the eardrum with the back of the nose. Whenever a person "pops" their ears, it is the eustachian tube that is opening up to allow any built up negative or positive pressure as well as any fluid to release into the back of the nose (watch video). In young children, they do not know to pop their ears when their ears feel funny which is why they are prone to getting recurrent ear infections as well as fluid build-up. As they get older, they figure out what to do which is why by the time most kids turn 8, they "outgrow" ear infections... that's around when they figure out how to pop their ears. There are some products (like the Otovent) out there that allow the parent to "pop" their child's ears, though some children may not be cooperative. Watch a video of a 3 years old child using the Otovent. Younger children may require an electronic version (ie, EarPopper). Watch video of EarPopper use. In adults, the eustachian tube itself may become clogged such that no matter how hard they try, they just can't get their ears to pop. This situation is called "eustachian tube dysfunction." Watch a video demonstrating this. So, why would placing a tube help in these situations? Really, tube placement is a "detour" whereby the natural eustachian tube is bypassed so that ventilation occurs through the ear canal instead of the nose. Furthermore, a tube allows for ear popping automatically. Another way of thinking about a tube is a hole in a balloon. When there is a hole in a balloon, no pressure can build up as it would automatically escape out the hole. are placed while under anesthesia. Why not while a child is asleep? Keep in mind that these are just guidelines and that there are extenuating circumstances in which tube placement earlier may be justified. Prior to tube placement, a baseline hearing test is mandatory. Tubes are placed in an operating room under mask anesthesia in young children and takes no more than a few minutes to perform. Tube placement in adults are performed in the office under local. There is no downtime and the adult is allowed to go straight back to work. No analgesic pills are required after this procedure and it is not unusual that antibiotic ear drops be prescribed for a few days. If an active infection is present at time of the procedure, some blood may drain out the ear transiently for no more than 1-2 days. A repeat hearing test is than obtained usually 4 months later. 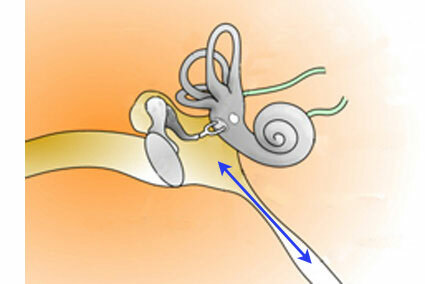 In this illustration, the blue arrow denotes the normal way in which the ears release any excess pressure or fluid into the back part of the nose. This is what happens when a person "pops" their ears. 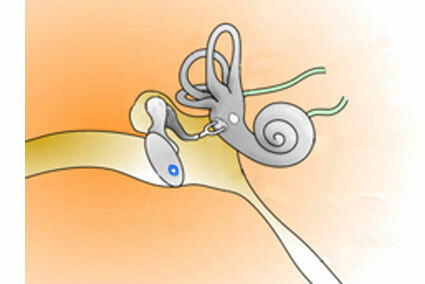 In this next illustration, a tube has been placed in the eardrum denoted by the small blue ring. 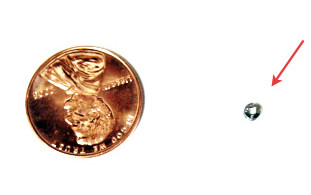 Below, an actual tube is shown next to a penny. Yes, tubes are really that small. Click here to watch a video of a tube being placed. In this last illustration, the red arrow denotes how excess pressure and fluid will ventilate into the ear canal through the tube bypassing the eustachian tube. IF an ear infection develops, pus will also escape through the tube and out the ear. If the tube wasn't there, this pus would have remained trapped in the ear and create intense pain. Tubes are made of different materials and sizes and as such, they may last a varying amount of time before falling out on their own. The most commonly used tubes are based on some variation of the "collar button tube." These tubes normally last (on average) about 1-2 years before coming out. The hole that was present when the tube was placed will then completely heal closed. At least in the young child with chronic ear infections, given tubes are meant to fall out on their own after a certain period of time, one can see that tubes are meant to only buy time until the child "outgrows" the ear infections. The corollary is that because the tubes usually fall out after 1-2 years, it is not unusual for some young kids (especially those who get their first tubes around 1 year of age) to get 2-3 sets of tubes placed before they finally "outgrow" their ear infections. With the need for repeat ear tubes, it is not unusual that adenoid removal also be recommended [more info]. Other tubes such as the "T-tubes" last for nearly 10 years and often require physical removal when they are no longer needed. 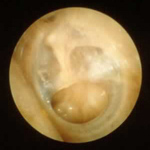 The reason T-tubes aren't placed more often is because there is a higher complication rate of a persistent tympanic membrane perforation (hole in the eardrum) which may require surgical closure. "Split tubes" last on average about 3-6 months. The vast majority of the time, ear tube placement will dramatically reduce ear infection frequency and severity. For patients where fluid is present, hearing will also dramatically improve. For those suffering from eustachian tube dysfunction, the cure rate is not as high... probably around 70%. Tubes falling out after 1-2 months instead of 1-2 years which would require the tubes to be put back in. Tubes have not fallen out after many years (>5+ years). That's also not a good situation and the tubes may need to be physically removed. The hole (perforated eardrum) doesn't close up after the tube comes out which may need to be surgically repaired. The patient is allergic to the material that the tube is made of causing persistent ear drainage. 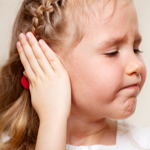 What happens if there is an ear infection? Should a patient with ear tubes develop an ear infection, purulent drainage that smells bad will come out of the ear. Why? Well, whenever an ear infection develops, pus is produced. Without the tubes, all that drainage would remain trapped inside the ear. With the tubes in place, all that infection is able to escape out. Better out than in! Should ear drainage (also known as otorrhea) be present, the mainstay of treatment is antibiotic ear drops. NO oral antibiotics are required. Common antibiotic ear drops include Cipro HC, Ciprodex, Cortisporin, Floxin, etc. If blood is also present in the ear drainage, ear drops containing steroids are preferred (Cipro HC and Ciprodex). Watch a video on how to administer ear drops here. If the ear drainage is severe, tissue spears can be used first to remove as much of the drainage as possible prior to using ear drops. If you feel you may benefit from tube placement, please contact our office for an appointment. Note that ear images used on this webpage were based on that obtained from Wikipedia under the Wikimedia Commons License. 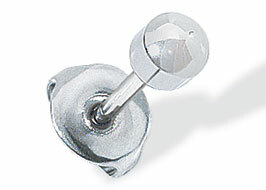 RANDOM: Treatment for Kids Who Keep Putting Objects in the Ear?? ?